Do Dogs See in Only Black and White? Growing up, I had heard that dogs see in black and white. It was easy for me to imagine how a dog saw the world as black and white televisions were still fairly common when I was a child. 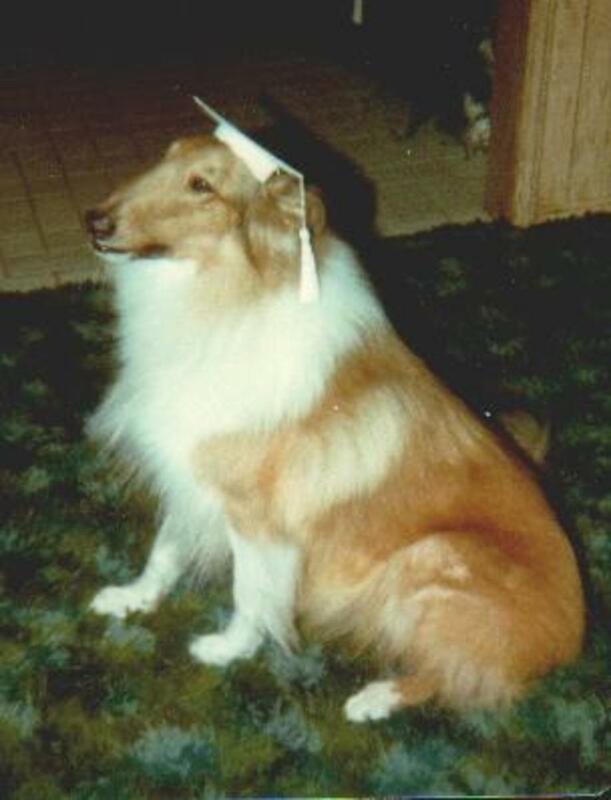 Watching black and white "Lassie" episodes, I was able to see exactly what I believed Lassie saw. Her black and white world was right there on my TV set. I have since learned that dogs see more colors than just black and white. However, they do not see the color spectrum that most humans see. Dogs, it turns out, are color blind. How Do Dogs See Color? "Cones" on the retinas at the back of our eyes allow us to see colors. Typically, most people have three sets of cones. Dogs and humans with color blindness have only two. This means dogs can see in shades of blues, yellows and grays. However, dogs have more "rods" in their eyes, which gives them better night vision. Check out the two color spectrums below to get a sense of the colors people can see versus what dogs can see. You may be thinking while knowing a dog's color spectrum is an interesting piece of trivia, it really doesn't matter from a dog training perspective. After all, we aren't training dogs to drive, so it doesn't matter if they can see red stop signs or green lights. However, with the upswing in fast-paced canine sports, the dog's color vision becomes a very important piece of knowledge that can help keep the dogs safe. Why Does a Dog's Color Eyesight Matter in Canine Sports? 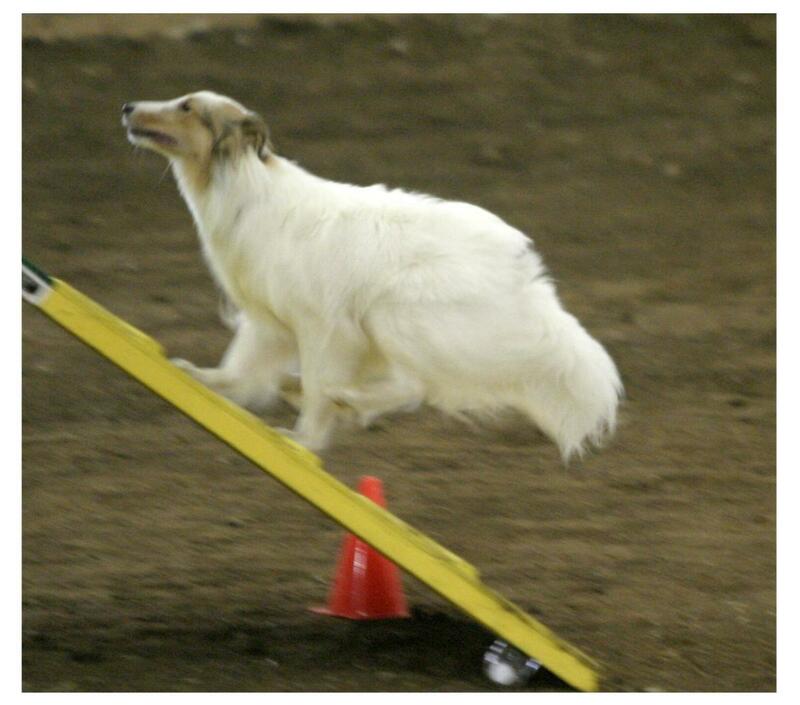 Take for instance the sport of agility, where a dog runs at top speed through an obstacle course. The dog must take the obstacles in a certain sequence, and each course is laid out differently. A handler has only a millisecond to communicate to the dog which obstacle is next. Poorly timed communication can not only result in the dog taking a "wrong course" obstacle, it can result in the dog miscalculating a jump or obstacle, "crashing," and possibly injuring him or herself. To ensure that the millisecond communication between handler and dog is clear, handlers work for years to train their dog to read the slightest physical cues such as hand signals, deceleration of forward motion, proper shoulder placement, footwork, and much, much more. These cues are perfectly placed and timed for the exact moment the dog will need that communication. Yet, if a handler is dressed in brown and is running on brown dirt in a horse arena with dull tan walls, all of the handler's hours and hours of preparation may be for naught if the dog cannot clearly and quickly visually distinguish the handler. This information from the handler is coming at the dog fast and furious. Except for occasional verbal information, almost all of the cues are non-verbal. The dog needs to respond to this information immediately. Fast dogs cannot take a second glance to see if they read that information properly. To help the dog, handlers must stand out visually from their background so that a fast-moving animal can see them. I learned this concept from my fast dog, Asher. We usually compete in horse arenas on brown dirt with dirty white walls and fencing. I noticed from videos of our runs that when I wore one of my favorite tan agility shirts Asher wouldn't see some of my physical cues. He wasn't intentionally ignoring them. He appeared to simply not see them. Yet, when I wore shirts that contrasted with the background, he appeared to see all of my physical cues. After several weekend agility trials taped with my tan shirt and other contrasting shirts, I saw the pattern and discovered that Asher did better if he could see me better. Of course, this is obvious when you stop and think about it. If I am going to be showing in an arena with dirt surface and dirty white or gray walls, I will choose shirts that are in the blue spectrum. This can include bluish purple shirts. I also can wear black. I avoid reds, oranges, yellows and greens as they will become shades of yellow and brown. I also avoid solid whites as they can blend with the white walls. If I am going to be competing on soccer turf with white walls or walls covered in advertisements, I again choose blue shirts unless the soccer turf is a bluish green. I can also wear black. I avoid reds, oranges, yellows and greens and solid whites. Remember, green looks like yellow to a dog. A handler also needs to pay attention to the color of their shorts or pants. They may even want to think about wearing long pants if they'll be running on dirt, as all colors of human skin could blend easily into the colors of a dirt agility surface. By wearing pants, handlers can make themselves stand out better from the background. This clothing contrast concept would be important not only for agility, but for almost all dogs sports from obedience to disc dog. Anytime a handler gives the dog a visual cue, it will help if the dog can see that cue clearly the instant it is delivered. 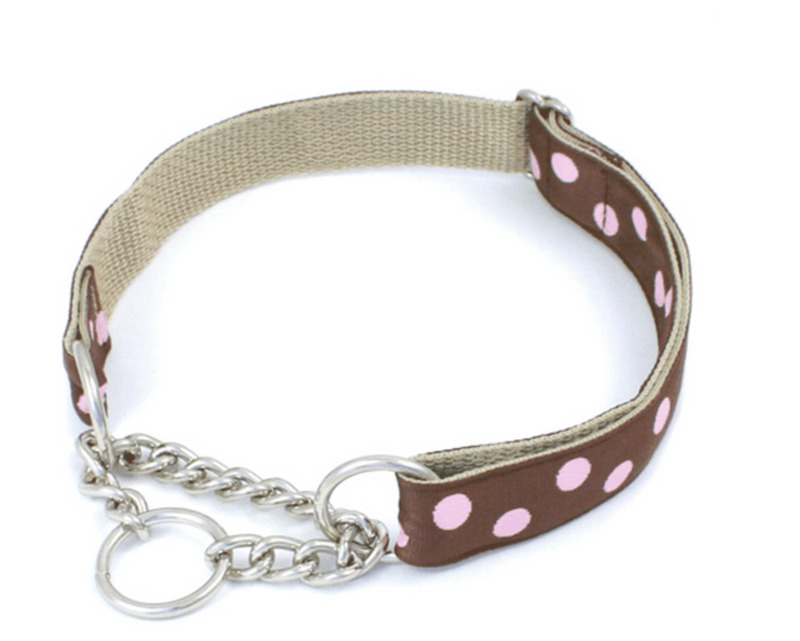 But clothing is not the only consideration when it comes to understanding color contrast for the dog. Training equipment must also be taken into consideration. For disc dogs, this would mean knowing the basic colors of the environment where the dog will be competing and using flying discs that will contrast with that color. If a disc competition is being held in a park with green grass and blue skies, then the discs need to be in shades of dark blue, white, or black. If a disc competition will be held in a park in the winter with dried, brown grass and gray skies, then discs in shades of blue, white, pink, purple or black would be best seen. For agility, this also means that agility clubs and schools need to have a full understanding of what colors dogs see when choosing paint colors for their equipment. Many agility titling organizations have rules on color options for contact zones (see video above), and most clubs go with yellow. If going with yellow, then the other color on the contact equipment should be a shade of blue. This way, if a dogwalk sits on a dirt brown surface, the yellow contact zone may be harder for the dog to see, but the rest of the dogwalk's up-ramp will be easily seen. Conversely, if a dogwalk painted yellow and blue sits on a bluish rubber surface, the dog may not see the blue part of the dog walk as easily, but it can very easily determine the yellow contact zone, allowing it to safely find the up-ramp. However, using contact equipment painted yellow and red on a brown or green running surface will cause the equipment to easily blend into the background as everything will be shades of yellow and brown. Remember, dogs don't see red. Instead they will see shades of yellow and brown. I believe contact equipment is best if painted the usual, albeit boring, yellow contact zones with contrasting blue bodies. Then, no matter the surface and background, some part of the equipment will pop out to the dog as it heads to the up-ramp. Colored agility jumps must be considered, too. Red, yellow and green jumps will all be shades of yellow and brown. 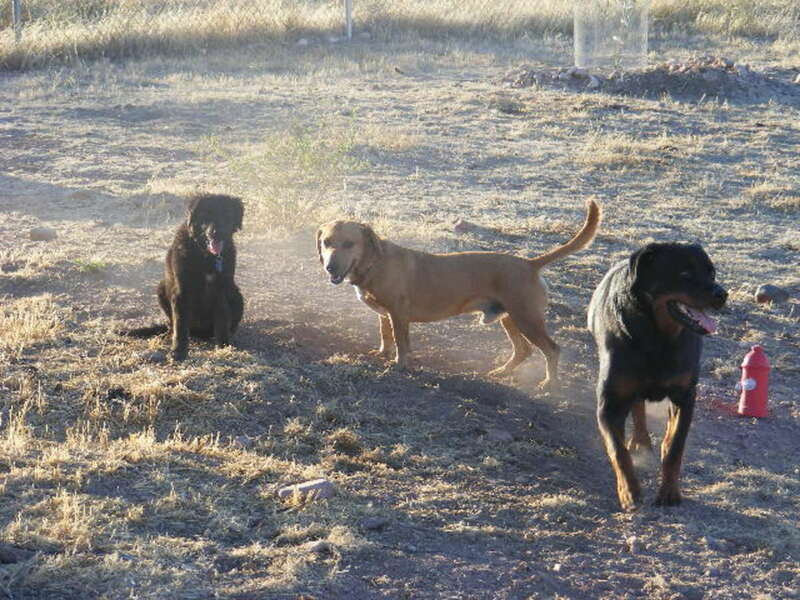 If they are located on a brown or green surface, the dog is seeing it all as shades of yellow and brown. The white bars do help, but solid white jumps with contrasting blue tape or bright blue jumps with white bars would probably be among the best color choices. A trend I am seeing in agility is to paint pause tables yellow. This is causing many dogs to run by the tables when the tables are placed on dirt surfaces as the yellow will "blend" into the brown. Handlers are often befuddled as to why their usually consistent dog avoided the table when the simple fact is that the dog just didn't see it. 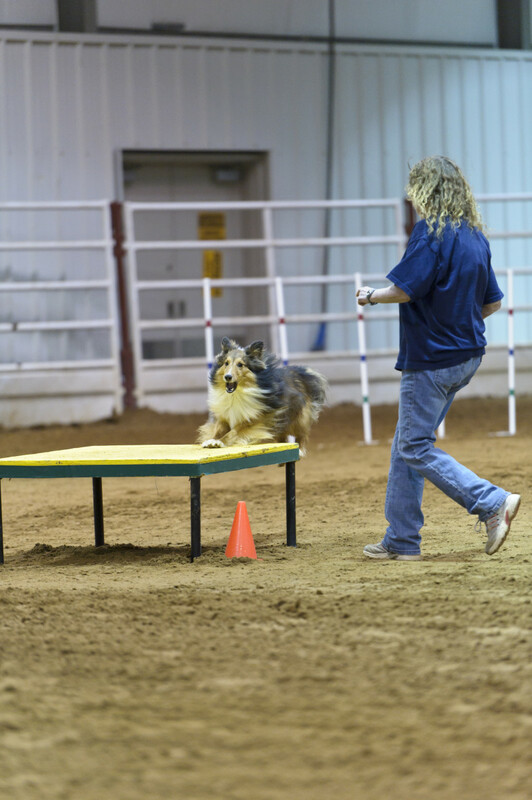 Dog safety is the most important consideration for any dog agility handler, and clubs need to be paying more attention to the colors of the trial sites where their equipment will be used. Based on that information, clubs need to choose equipment colors that will help the dogs see the equipment easily and quickly. Other dog sports need to take dogs' color blindness into consideration as well. From flyball to obedience competitions, teams can gain an edge by paying attention to contrasting colors from the dog's perspective. 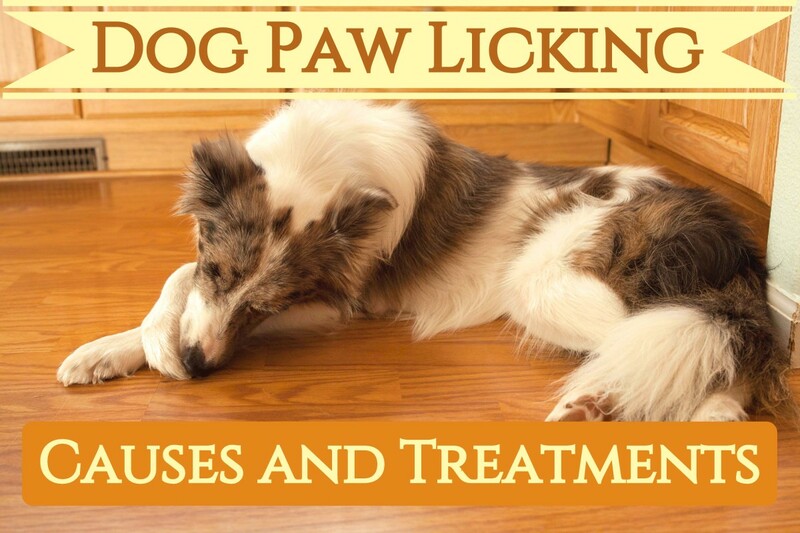 Even when training a house dog, this knowledge is helpful. If asking a house dog to learn to fetch a stick on winter brown grass, it will be harder for the dog to see where the stick is thrown. Instead, use a toy in shades of blue on that winter brown. For the house dog, it might be wise to make the dog's "things" color contrasting to the environment. From dog bowls to beds to toys, having them visually stand out to the dog will make them easier for the dog to identify and might make them more engaging to the dog. This information becomes a bit obvious once it is pointed out, but paying attention to contrasting colors in dog training can help your dog learn faster and stay safer as you both play together. What Colors Do You Think About? When training or competing with your dog, do you pay attention to the color of your clothing and equipment? Why do dogs hate orange if they can’t see it? It can’t be a coincidence that dogs generally dislike the hi-vis jacket and bag of the postman and, in particular, my orange broom, can it? I suspect your dogs dislike those things not because of the color, but because of what they do. Some of my readers have said their dogs love orange. And dogs can SEE orange, just not in the same way we can. It will have a different hue to them. I have a step on my car to make it easier for my dog to get in and out of the car. The step is black and so is the blacktop. Should I paint the step white? If he isn't having trouble seeing where the steps are, I wouldn't worry about it. If he seems unable to see them to navigate them safely, then I would consider painting them something to contrast with the blacktop or gray concrete. 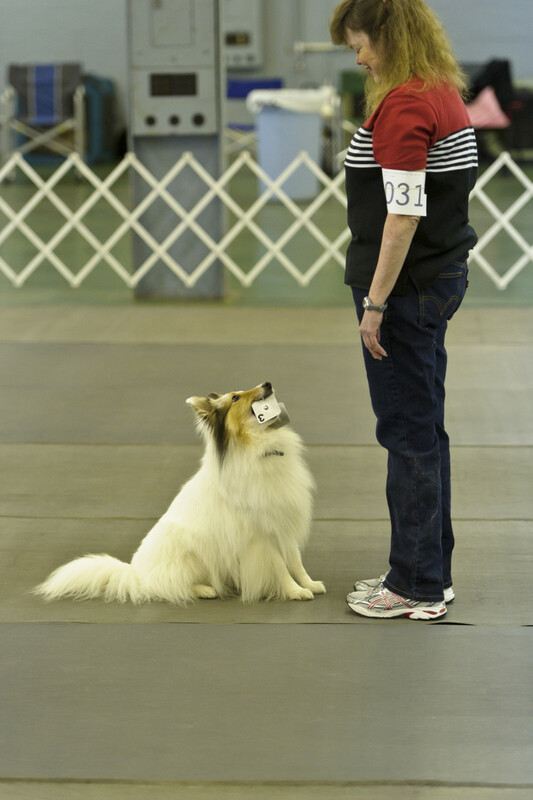 What is the best color to wear to a dog's agility trial with black floors and cream walls? I was just at a beach about a little over a week ago. I think black would work very well depending on whether the beach is surrounded by black rocks or dark water. The beach I was on was sand colored with a blue ocean. I, personally, would choose a toy with different colors in it. My ball was blue and yellow, I believe. Blue worked great on the sand and yellow worked great in the water. I usually choose blue and yellow toys if possible, although there's nothing wrong with other colors. It's just easier for you dog to find a toy that has better color contrast. What colour ball is best to play with on a beach. Ive just got orange, black, and white and black like a football off kong. Which would be best please.? That is very interesting information to know. I am sure that my cousin's wife who not only trains but also shows her dogs knows this information. I did not realize that dogs have better night vision than we humans. I had heard that about cats. Thank you for writing this article. Preparing for a puppy in the new year, I wondered if colours would impact on some of the training tools so I decided to do a little research. You have done that already! This is so useful and I hope I make a better, informed choice when I make my purchases now. Thank you again. That's a good question. Blue could be a real problem if the water is swimming pool blue. Depending on the water and the environment (Green grassy land? Brown earth? Blue sky? Gray sky? Blue water? Dark brown lake water?) I would contrast to the environment based on the color chart in the article (greens are yellow to a dog and reds are shades of brown.) Black might work, depending on how dark the water is. Yellow might be great depending on if the water is blue or greenish or brownish. A bumper with two different contrasting colors might be great - say black and yellow or black and bright orange. I think the color of the water, sky and surrounding ground at your dock diving venue would play a huge role in determining your color. I've seen my dogs run right by yellow tables on green turf. That would be yellow on yellow to the dog. They eagerly get on the table, so it was strange to see them run by, turn and look like, "Hey! There's a table there!" This could explain why my dog acted like he didn't see the table in competition. Our table at home is dark blue. A very helpful article. Thanks! 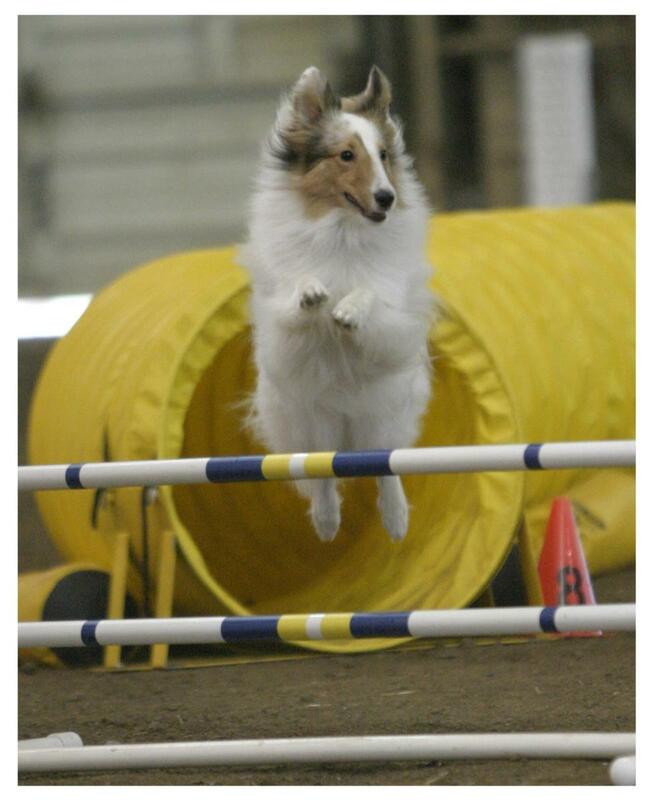 I've been doing agility since the mid-90's and have competed in 4 venues. I've lived through two-toned tunnels and solid color tunnels, striped bars and bare bars, and equipment of all kinds of colors, shapes, and sizes. Generally, I've found that the dogs don't have a lot of trouble getting safely through the course no matter what the equipment looks like. The equipment color issue is usually a bigger concern for the handlers, particularly AKC competitors. As long as the dog has been reasonably well trained and can distinguish the obstacle from the background, it will get through the course just fine. I am thinking of buying a ramp for my dogs to get into my grey truck. It is available in beige or grey. Would it be easier then for my dogs too see the lighter color/ beige since it is a contrast? Clean Run has some dog toys made specifically for dogs' vision. You can Google "Clean Run Agility" to find them. I love their Lotus ball treat ball. My baby sheltie Aenon LOVES his. This irks me even with dog toys. Nothing like having nothing but green or red balls to choose from when I often play on a grassy field...Can a man who loves his dog get stark white, or at least yellow or blue or something with white and black markings? I even notice this when playing at home. His FAVORITE ball is a foam baseball that's white and black. He can see it very well. His too-big-for-him-but-soft toy soccer ball he sees easily. It's just...too big for him to carry (hits the ground when he walks). I also have a blue and yellow ball and take both depending on what surface we're on. Why dog toy makers make things in colors hard for DOGS to see? It just makes me SMH. I try to keep my clothes in mind, though I'm guilty of the football jersey sometimes. I try to wear black or white on some part of me. This was a very interesting article. I have had dogs my whole life and always thought they only see in black and white. Thanks for the info. Good job to those little shelties! Their intelligence and agility knows no bounds yet they are often underutilized. One thing you didn't mention, that I've noticed here in the damp Pacific Northwest, is that when running on some dirt, the yellow contact areas often become nearly brown by the end of the day (or, especially, the end of a 3-day trial). Some arenas are worse than others, I think because some dirt has more clay in it. Even to me, the dirty yellow blends into the dirt and is hard to see. It's an issue for run-by's but also for discriminations (which almost always involve a contact). Maybe we should be paying more attention to cleaning contacts during a trial, in these circumstances? It's really strange how dogs can still easily recognize different colours even thought they're colour blind!! Now that I have this information, it is fun to watch the dogs struggle to see different colors. I have a soft flying disc that is blue on one side and yellow on the other. If it lands with the yellow side up, the dogs struggle to find it. If it lands with the blue side up, they see it quickly. Dog toy makers are starting to make toy colors based on this information. The last toy I bought was made for dogs' vision and was blue and yellow. There appears to be some debate about a dog's ability to see "bright" colors. That said, I would reconsider your Packer's shirt if you are running on soccer turf or green grass. If you are running on dirt, you might consider green. It would be a dark yellow on brown. You also have to take into consideration the walls too. I love my Patriot's shirt, and I do wear it if I am not running against a cluttered background. The blue stands out. I saw some old throwback (WAY throwback) Green Bay jersey's on line that were a blue with a yellow number. They were cool looking. I think they must date back to the 20s or 30s. Personally, I find my dogs see me best if I am in black (as long as the venue has good lighting). I am slowly switching my agility wardrobe to more black and dark blue. As for tie dye, that would probably depend on the tie dye colors and on the background. Tie dye would not work well against a cluttered background. I think a blue tie dye would work well for most venues (except for blueish/green soccer turf). I didn't know dogs are color blind. 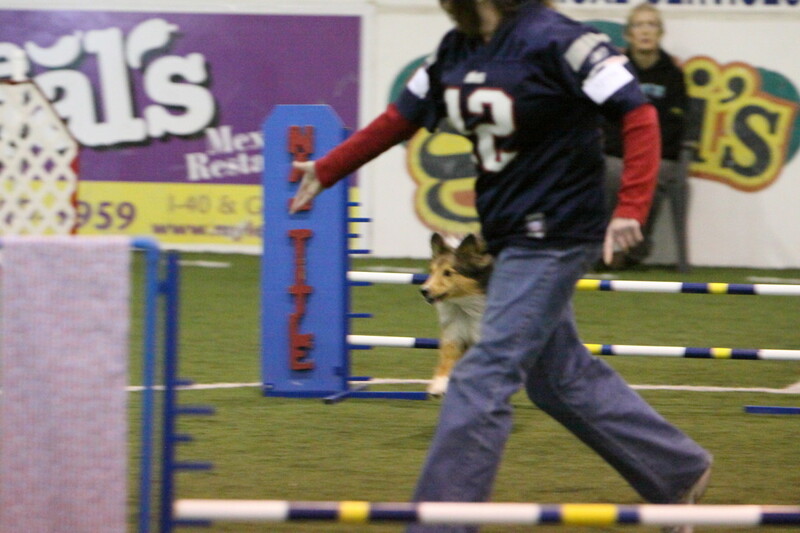 I compete in agility and I always choose bright clothes because I thought that would enable my dog to see me better. Unfortunately for me, I have to ditch my green and gold Green Bay Packer t-shirts. Lots of people wear tie-dyes. Is a shirt like that confusing to a dog? Now I know that dogs can also see colors. I thought they can only see black-and-white. Well anyway, thanks for the good hub! I learned so much from it. Since it will be hot, I may choose white. This color stuff is great for agility handlers, gives us a better understanding of WHY our dog may not be performing as well as they do in practice. If Friday doesn't go so well, I'll try blue on Saturday. I have an agility trial next weekend on grass. what is the best color to wear on green grass. thanks. LOL!! Yes white on snow is probably not the best bet. Thanks! we're outdoors all year in alaska so white will blend into snow (no walls) so white doesn't seem like the best bet, but the yellow blue combination sounds good. sound show up good year round. great tips about clothing too! My pit bull will pick toys that are red to play with other than any other color besides yellow. His first toy was yellow and he loved that toy, always played with it. We bought other toys that were different in color like white, blue green, etc. and he acted like he didn't see them. I bought him a red fire hydrant and he only plays with the yellow and red toys. My other dog is a lab and she'll play with anything no matter the color. Thanks for taking the time to comment, Stelling21!!! I see far less "why didn't he see that?" mistakes in our handling since I started paying attention to my clothing color. It's been really interesting. Thank you. I knew that dogs were colour blind but didn't think about the handler clothing aspect. Now that I have, I can see the pattern emerging as to why my changes of clothing may have possibly affected our results. An interesting concept worthy of future note. I found it interesting when doing the research as well wiserworld. Thanks for dropping by!! This is really interesting. Never knew dogs had such a different color spectrum than we do. Thanks for sharing. 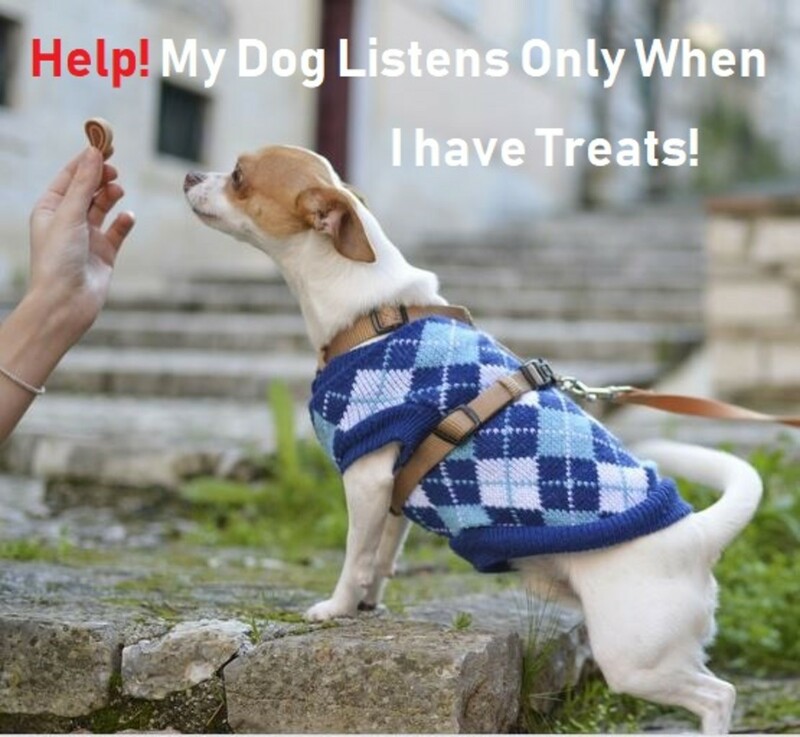 dogs are more aware of their world, olfactory, audio, and the ability to see motion than "humans". Enjoyed this article! I'm a first time dog owner and loving it. 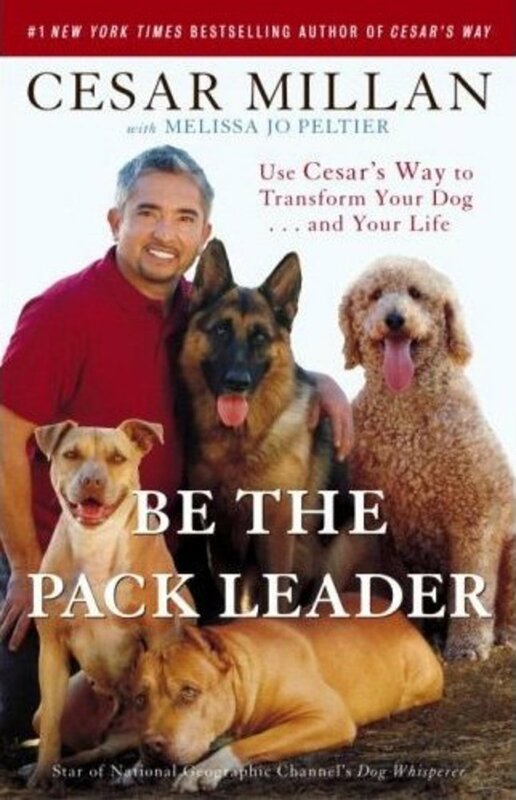 I try to read as much about dogs as possible and learning something new everyday. They're incredible animals and I've grown such love for them since owning one. Thank you for this! I read in the comments where someone's dog(s) see orange. I have a Lab that I have trained for ring and field and have noticed that when I use the orange training dummy he has to use his nose more than when I use the white one. So, as a result I tend to use only the orange one when training and the white one just for fun. Great article and very well thought out and put together. Thank you for dropping by Doodlehead!! 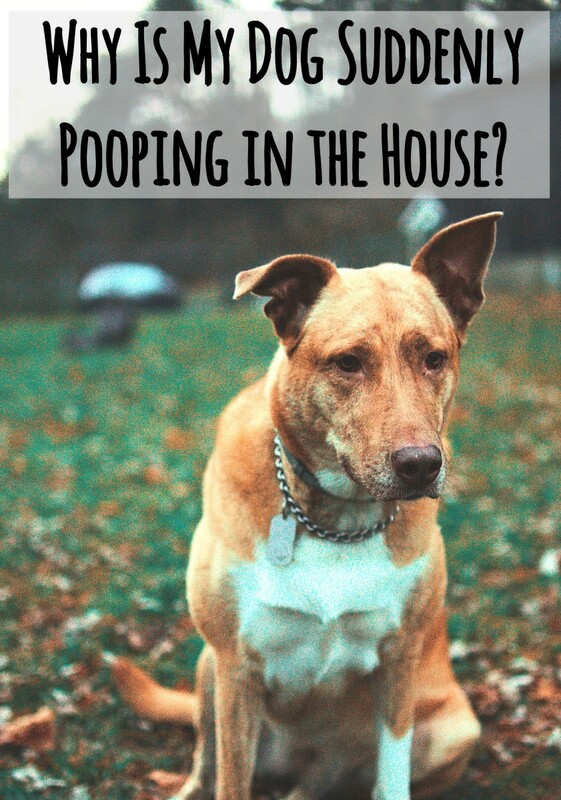 I've been watching my dogs since writing this article, and it's been interesting to see their color choices. They can really struggle to fetch toys that blend in to the surface based on their color vision. I have tried to get my dog to prefer to fetch a red "squeeky" but he prefers to play fetch with a yellow tennis ball. Based on this, part of the problem (and it seems to play out) is he can't see the red squeek toy as easily when I throw it. He can't find it as easily either. Interesting. Thank you barbat for dropping by and reading!!! A lot of very talented dog trainers are only now beginning to take into account color in their training. I know since doing this article, I'm starting to gather a blue agility wardrobe for trials, and I bought a lot of blue toys for my new puppy. It's interesting to think about for sure. Since I read this, it made sense why one of my dogs didn't respond as well...she couldn't see me well. I am no pro by far so this was a very interesting piece of insight for me! I found that shocking myself!!! I may have to shock the border collie world with your other list of top 5 agility dogs! Always love your hubs...while never got involved in competitions with my dogs, I never knew what it entailed. Wow what an interesting set of hubs I intend to read more as I have time. Thanks agilitymach and those corny puns are fun, I made it by accident! lol take care and write more! LOL barbat!! Intended or not, it was a good pun. :) Thanks for dropping in to read!!! Gee this was an eye-opening experience..no pun intended, really! I really thought the spectrum was in grey tones prior to this article! Very interesting and thank you! I absolutely think color does have a role in some of those cases. When I play with toys that would be more visible for dogs, they easily find them when playing chase. If the only toy I have available is say red ball and we're playing on a field of winter-dead, brown, short grass, the dogs easily lose it on the brown grass. Red is just brown to dogs. :) I try to buy fetch toys with two different contrasting colors if possible - say blue and yellow. It's not always possible, but I sure see a difference with those toys. Interesting hub! I'd always thought about this with horses, as I've had the experience of trying to get over badly painted fences, but I hadn't thought about how a different visible color spectrum could affect dogs, too. I can't help but think of how many people I've met who mention that their dog is "ADD" when playing and will simply desert a toy they were in the midst of chasing. I wonder if color has a role in some of those cases? You're so right Nature. Even if it's just for fun training, it helps so much if the dog can see the training props better. Thanks for dropping by!! Interesting. The black and white sure does make good sense. I've had others say their dogs like orange too, so there is something about the blend of colors that makes up orange that might pop for the dogs. Thanks for commenting!! As a retriever field trialer, we use orange bumpers when we want to hide them in green grass, white and black bumpers when we want dogs to see them in the air, and white and black clothing so the dog can see us at a distance when handling them on blind retrieves. I found this a fascinating read, thanks for sharing. Yes, ETS affects so many dogs. I have a few students whose dogs have ETS. One has managed to compensate tremendously well and has three MACHs now. The other is really struggling. Recognizing how vision affects dogs, especially in fast moving sports, is so important, and it's great that people are starting to give it attention. Thanks for dropping by!!! Not sure why, but orange has been the favorite color of all 3 of my dogs. I have had the same football in 3 different colors & all 3 would go crazy over the orange one, but never play with the other colors. My current competition boy is blind in 1 eye, so I have spent a lot of time researching how to give myself the best visibility in training & in the ring. My dog sees 'orange'......no question about it. And it's his favorite color. Orange items from around the house are constantly ending up in his doggie bed. Orange pillows, orange toys, orange balls, orange frisbees, orange sneakers, orange t-shirts.......he claims them for his own. A very interesting read! I like the chart showing how dogs see colors; it's very effective. 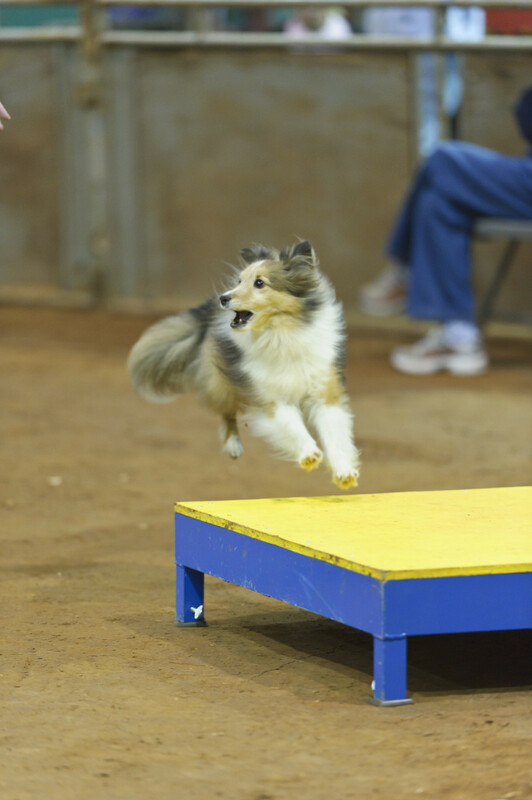 I don't compete in agility, but I can see how colors can affect dogs in different dog sports and many training scenarios. Voted up. Great work done here and thanks so much for posting to give all of us that do agility a better understanding of how important color is, not only in the equipment, but especially in what we are wearing. Good Job girl. Wichita Falls. I thought it was black and white for years too. I think it's cool they see color. Thanks for stopping by!!! All my life I thought that dogs only see black and white. It's just after after reading this article that I learned that they also see other colors - just less than what most people see. Very interesting hub (voted up!). I was just wondering this week which colors dogs can see as I have heard before that they are colorblind, but did not know much beyond that. Thank you so much wetnose. This is something I heard a while ago but didn't realize how important it was to my dog until about a year ago. Now I'm trying to get a bunch of blue and black agility tee shirts to wear at trials, but what am I going to do with all of my red, green and brown tees. :) Fortunately, I always wear blue jeans to trial in. I didn't realize dogs are color blind. I learn so much from your hubs and it is always fun to watch your videos.